The Bishop’s Daredevil Stunt Club is a band that makes their home in Chicago, Illinois. Made up of: Billy Giricz – vocals, guitar, keyboards; Paulette Bertrand – vocals, keyboards, guitar; Dan Passarelli – bass, vocals; Luke Smith – drums and Darin Gregg – guitar, trumpet, the band creates music that is equal parts rock and roll and pop-rock. That combination helps to create a sound that is very infectious and very radio-friendly at the same time. The style of the band’s songs alternates between modern-day rock and roll and rock and roll from years gone by. The band calls upon influences such as The Beatles, The Rolling Stones, Norah Jones and Wilco and those influences creates a nice mixture of styles to draw from, making the band’s music very different from one track to the next. Having already adding to their musical library by releasing an 11-song self-titled release in August 2014, the band returned the very next month with another EP, the 7-track release entitled Veva, Hold On! The Bishop’s Daredevil Stunt Club’s Veva, Hold On! EP begins with the song “Bob’s Yer Uncle”. The track features a very strong Alternative Rock backbone while still having plenty of Pop influence thrown in. The track draws upon the guitars to create the body of the song. The keyboard from Paulette Bertrand adds a slight melodic undertone to add a nice amount of beauty to the energetic feel of the music. Veva, Hold On! continues with the track “Days at the Pool”. With this track, the band takes a more relaxed approach to the music on the track with a stronger Pop approach to the music. Like “Bob’s Yer Uncle” before it, “Days at the Pool” is guitar-driven. The synthesizer that appears on the track gives the song a slightly dated feel, but that helps gives the song some character. The song contains simplicity to the music while also feeling very commercial. “Days at the Pool” is one track on Veva, Hold On! that deserves multiple listenings. One of the best and strongest tracks on the Veva, Hold On! release is the song “Treat Yourself”. With this track, guitarist-keyboard player-singer Paulette Bertrand takes center stage as the main singer. Her vocals give the track a nice amount of pop feel while also setting the song apart from the rest of the album. The song is easily the one with the most pop influence of any of the tracks on the release. It’s also one of the strongest tracks on the EP. For the song “Singlehandedly,” The Bishop’s Daredevil Stunt Club brings a lot more Alternative Rock feel back to their music. The main guitar on the track gives the song a lot of energy. The track brings to mind music from bands like Weezer, Better than Ezra and others who made names for themselves back in the nineties. Along with music that is unmistakable in its style and sound, the track also features a chorus that is very infectious and invites the listener to sing along with it. Like “Treat Yourself,” “Singlehandedly” ends up being one of the standout tracks on the release. Altogether, “Singlehandedly” is a track off of Veva, Hold On! that will have lovers of that time period reliving those days as they listen to the track. On the song “Jaws of Life,” the band creates a track that may remind many of something from a band like Weezer. The song feels just a little off-kilter with an overly simplistic rock feel to it. The addition of the harmonica also adds an unusual quality to the already unique sound of the song. Taking all of the various elements in the song, the track ends up being perhaps the most unusual of the songs while still containing a fun and appealing feel to it. The Bishop’s Daredevil Stunt Club brings Veva, Hold On! to a close with the title track. “Veva, Hold On” is a track that, once again, features a very infectious Pop influence. The pop-rock music on the track will have you jamming along with the song and the lyrics on the track are simple enough that you will find yourself singing along. 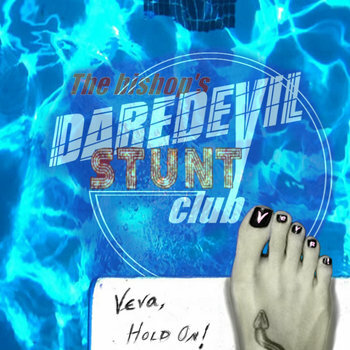 The Bishop’s Daredevil Stunt Club’s new EP of Veva, Hold On! is a strong seven-track release that changes styles throughout the tracks and brings out the band’s musical influences. Along with the “Summerlude (outro)” track, the release has many moments that are great to listen to. To check out the entire release of Veva, Hold On! from The Bishop’s Daredevil Stunt Club, check out the band’s Bandcamp profile.